[Num,Den,AllpassNum,AllpassDen] = iirlp2bpc(B,A,Wo,Wt) returns the numerator and denominator vectors, Num and Den respectively, of the target filter transformed from the real lowpass prototype by applying a first-order real lowpass to complex bandpass frequency transformation. This transformation effectively places one feature of an original filter, located at frequency -Wo, at the required target frequency location, Wt1, and the second feature, originally at +Wo, at the new location, Wt2. It is assumed that Wt2 is greater than Wt1. Relative positions of other features of an original filter do not change in the target filter. This means that it is possible to select two features of an original filter, F1 and F2, with F1 preceding F2. Feature F1 will still precede F2 after the transformation. However, the distance between F1 and F2 will not be the same before and after the transformation. Choice of the feature subject to the lowpass to bandpass transformation is not restricted only to the cutoff frequency of an original lowpass filter. In general it is possible to select any feature; e.g., the stopband edge, the DC, the deep minimum in the stopband, or other ones. Lowpass to bandpass transformation can also be used for transforming other types of filters; for example real notch filters or resonators can be doubled and positioned at two distinct desired frequencies at any place around the unit circle forming a pair of complex notches/resonators. 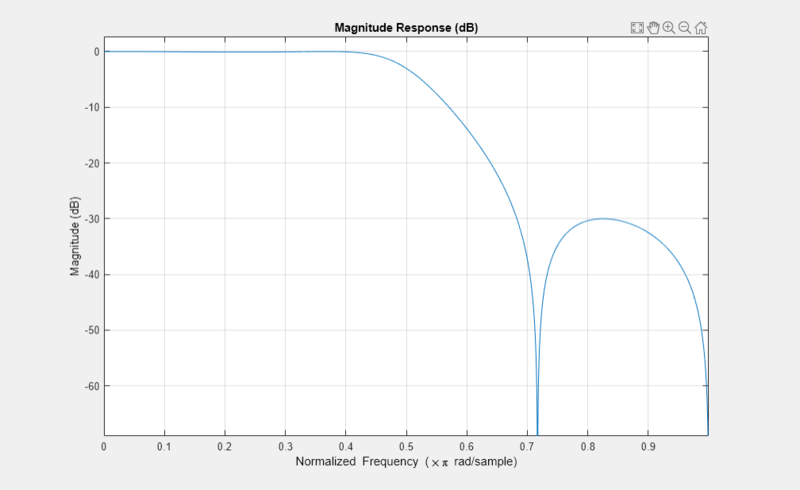 This transformation can be used for designing bandpass filters for radio receivers from the high-quality prototype lowpass filter. Create a complex bandpass filter by placing the cutoff frequencies of the prototype filter at 0.25π and 0.75π. Frequency value to be transformed from the prototype filter. It should be normalized to be between 0 and 1, with 1 corresponding to half the sample rate.